Tally ho, pip pip, and Bob's your uncle! Tonight we're going to have a tenuously themed dinner in celebration of Lady England and all the nations she has previously ensnared in her imperial tentacles! This may be one of our more loose themes as this pretty much covers cuisine from 90% of the Earth's countries. 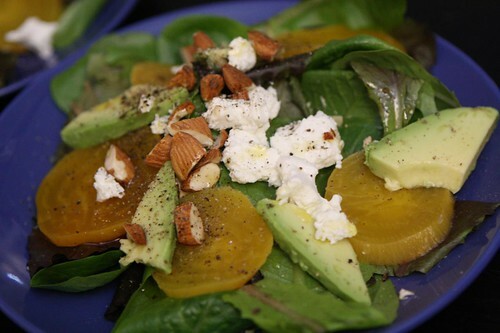 First up I made this salad with baby lettuce, golden beets, goat cheese, crushed almonds, and avocado. I drizzled a little olive oil over the top and served it with salt and pepper. Wow, did I already lose the theme on the first dish? 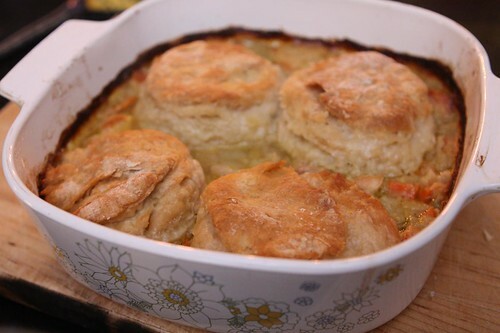 Next up, Jen made her style of chicken pot pie which is really kind of like chicken and dumplings. This is what she grew up on in Canada which still puts the queen all over there money and celebrates a culinary tradition that is like a fiendish hybrid of British and American cooking, thankfully borrowing some of the less terrible elements from both nations. 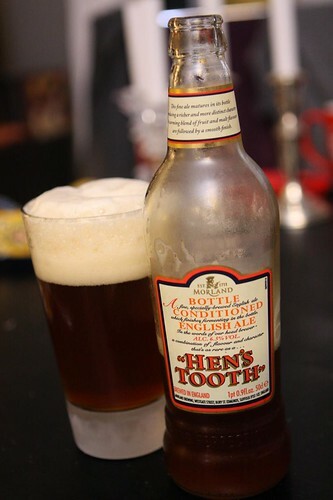 For beer I cracked open this Hen's Tooth from Greene King / Morland Brewery, who seem to specialize in making hen-themed beers. I enjoyed this one more than the last hen-themed beer and, apparently, more than all the reviewers on beeradvocate. It was very, very tasty and interesting. It had a fizzy carbonation and a characteristic that I like to refer to as "imaginary chewiness." Yeah, I'm pretty much an expert at describing beer. 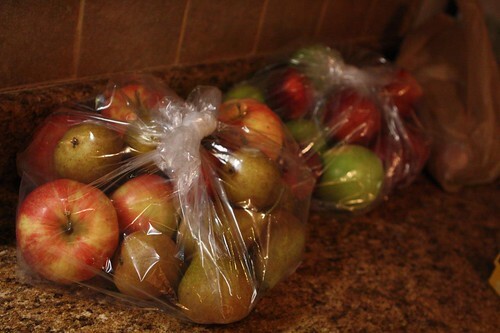 Today I rushed over to pick up our bi-weekly fruit share after work where I was given another enormous amount of apples in pears, this time including Bosc Pears, Empire Apples, Jona Gold Apples, and Mutsu Apples (also known as Crispin). 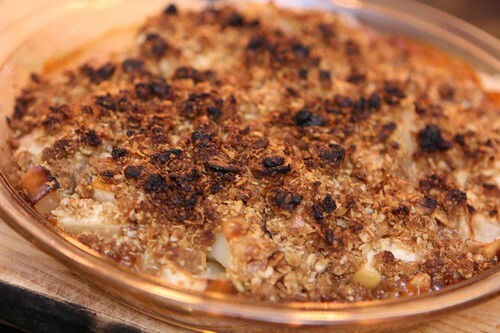 With all these apples I crossed back over to this side of the Atlantic to make an apple crisp. I happened to have some leftover crisp topping in the fridge from the last crisp I made and I cut up two apples (they were huge) to make this enormous pie plate full of apple crisp. We let the crisp cool slightly before diving into it after dinner. Along with some fresh new episodes of Psych this pretty much capped off the perfect evening. By the way, Psych is based on the Victorian era crime novels by Sir Francis Crumblesmith. I love it when a theme remains strong. Labels: beer, Dessert, Film and TV, How'd we use it?, Leftovers, salad, What'd we get?